An artist's impression of the very light rail innovation hub. Photo: Dudley Metropolitan Borough Council. The town of Dudley in the UK’s West Midlands could become a worldwide centre for the development of “very light rail”. 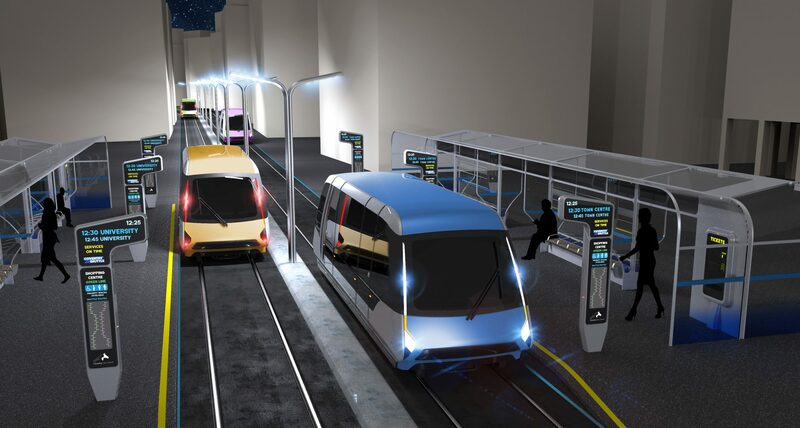 Dudley Council, in partnership with the University of Warwick’s Warwick Manufacturing Group, has submitted plans to open an innovation centre for the next generation of light rail systems, which it hopes will be at the heart of revolutionising the technology. The proposed site includes a large engineering workshop, 2km of double track along a disused railway line and test platforms, as well as meeting rooms, laboratories, teaching facilities and exhibition and conference space. An artist’s impression of the Coventry very light rail system. Photo: University of Warwick. Dudley’s cabinet member for planning and economic development councillor Ian Kettle said: “If given the go ahead the innovation hub will put Dudley at the forefront of the world’s development of very light rail technology. Dudley Council has been awarded £18 million by the Black Country Local Enterprise Partnership towards the cost of the project. In total, the project is expected to cost in the region of £29million. In September, researchers from the University of Warwick unveiled an early concept design of what a very light rail system in Coventry could look like. With new jobs created at this new facility in Dudley in the West Midlands. I do think Very Light Rail rolling stock vehicles could be built to replace the Class 139 units that are currently operating on the Stourbridge Junction-Stourbridge Town Line operated by WM Railway. Aswell VLR vehicles that could be used on branch lines in Cornwall and possibly used on the West Ealing-Greenford branch line in West London and on the Marks Tey-Sudbury branch line in East Anglia (with Class 755’s to operate on other branch lines). They should design the world’s first CycleTrain!, enclosed cycle pods gliding on an embedded monorail using gyroscopic stability with electric motor assist, entrained cyclists with windfaering on rails could easily achieve highway speed.